Last Christmas amongst the umpteenth showing of bland predictable tiresome family movies, Only Fools and Horses and the Queens Speech lay a program The People of New York Vs Jerry Sadowitz. It was Sadowitz crystalised into 30 minutes complete with cabaret appearances from the likes of Saddam Hussein and George W Bush. Just 3 months after September 11th (although it was filmed before this date) you could call it a little insensitive, but as I'm sure Jerry would agree the events of September 11th do not change the fact that America still houses a nation of "stupid c**ts" of which none are bigger than Bush himself. 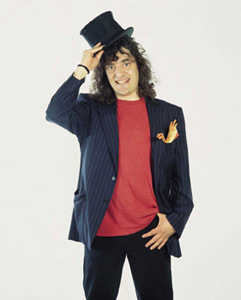 After making as many enemies as friends during his Edinburgh Festival appearance earlier in the year, Jerry hits the road in the amusingly titled "Jerry Sadowitz Tourrette - A small national tour of offensive comedy". Stopping off at Manchester University of Friday 25th October he arrives slap bang in the middle of the Manchester Comedy Festival, a festival for which he was not only uninvited but most likely asked not to come for fear of unsettling an event which at best is little more than a grouping of regular comedy nights in the city. And what can we expect from one of Britains most offensive comics? Magic, well not a lot for this tour is purely focusing on his stand up material. A little bit about The War Against Terrorism aka T.W.A.T - probably. Ulrika meets Sven meets John Leslie - more than likely. Pilferring Butlers and the Peoples Princess - oh yes. All the fun we read in the tabloid rags each day with a few hot topics from the twisted mind of Sadowitz. And like all great artists he does so not to purely offend, but to approach things in the only way he knows, he goes on to explain “Every day I open the paper and read about another atrocity – another child murdered – and it affects me. Everybody deals with events such as these in their own way and mine is to confront it through comedy. If audiences are not prepared to face what’s really happening out there then they can f**k off and stop reading the papers. Society does not compromise, why should I?”. So instead of heading out to the Comedy Store for one of their regular nights masquerading under the banner of Manchester Comedy Festival Event, come and see one of Britains most challenging comedy talents.